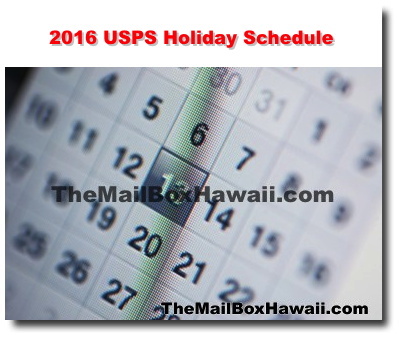 For any last-minute mailing needs, here is the 2016 USPS Holiday Schedule. Revised holiday hours will be posted at each local Post Office. Blue collection boxes that have final collection times before 12 noon will not be affected. But those that have final collection times scheduled after 12 noon may be picked up early. You are encouraged to drop your mail in the blue collection boxes by 12 p.m. for early pickup on Dec. 24th and Dec. 31st. Post Offices nationwide will be open Christmas Eve, but many will shorten their hours and close at noon. Check with your local post office for their hours on December 24th. Regular mail will still be delivered on Christmas Eve. Since this falls on a Sunday this year, Post Offices will be closed on Christmas Day (Dec. 25th) AND Monday, December 26th, the observed federal holiday. Local post offices will operate regular hours on December 31st and regular mail will be delivered. Since this falls on a Sunday, Post Offices will be closed on January 1st AND Monday, January 2nd, the observed federal holiday. All Post Offices will be open and regular mail delivery will resume Dec. 27 and Jan. 3rd.